The Kilties perform at an early-summer event on June 9, 1974, in Park Ridge, Ill. 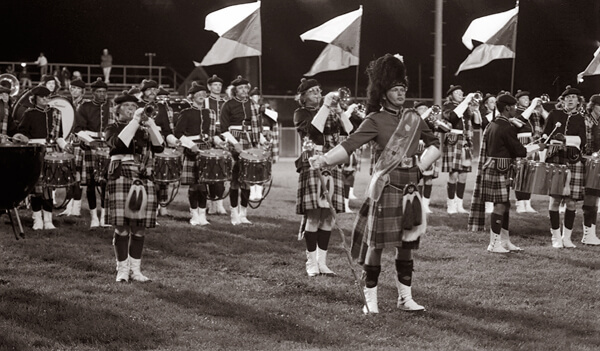 In their unmistakable kilted uniforms, the corps from Racine, Wisconsin marched on in 1974 to a sixth-place finish at the DCI World Championship in Ithaca, N.Y. It was the third straight of six total years that the corps would appear as a finalist. The '74 Kilties performed a relatively eclectic repertoire that included Frederick Loewe's "Fanfare from Brigadoon," Emerson, Lake and Palmer's "Karn Evil 9," and Henry Warren's "Chattanooga Choo Choo," among others. Like they did in almost every year competing in DCI events, the Kilties tied it all together at the end with their signature piece, "Auld Lang Syne."